Category Archives for "End of Day Analysis"
It’s been another rough stretch for the S&P 500 as prices tumbled to the lowest levels of the year. Monday crashed through 2,600 support, triggering an avalanche of defensive selling that didn’t stop until we fell another 50-points. Tuesday was a little bit better since prices closed unchanged, but that disguised the fact early gains didn’t stick and we stumbled back to breakeven. Few things are more disheartening than fizzled rebounds. Bears want us to run screaming from this market because it is so obviously doomed. Unfortunately for them, they are living in the rearview mirror. They are beating their chest over what has happened. But in the market, we only profit from what is ahead of us. Currently, the market rests 13% under the 2018 highs. The question we need to be asking is if it better to be selling these discounts, or buying them? A quick history lesson. The S&P 500 has only fallen more than 15% from all-time highs 11 times. The last two times were the dot-com bubble and the 2008 financial crisis. Do current conditions resemble the dot-com bubble where average p/e’s of tech companies were nearly 100? Or the financial crisis where the entire banking sector was so overleveraged it nearly went out of business? Some people think so and clearly they should be selling everything they own and burying it in the backyard. But for the rest of us, do we really believe the economy is on the verge of a collapse that has only been seen a handful of times over the last seven decades??? No doubt bears will crow that I was bullish two months ago in October when the market dipped to 2,600 support, and then again when it fell to the low 2,600s in November. I guess they were right since we now find ourselves under those levels. But the thing to note is it took two full months to fall another 50-points. That’s less than one-point per day. Wow, terrifying stuff!!! “It is shocking to see the amount of gloating going on every time the market moves to one edge of the trading range or the other. We’ve been bouncing between 2,600 and 2,800 for most of the last two months. Today’s dip and reversal count as the 7th time the market challenged and failed to break out of this range. Has anything changed? No, of course not. Bears are as confident as ever, and bulls are cowering in the corner. This is a mirror image of two weeks ago when the market was challenging 2,800. The last seven times bulls and bears were bragging about their success, the market reversed ran them over. Will this time be any different? No, probably not. But I don’t mind. I will continue betting against the crowd, and so should you. While I like these discounts, the looming Christmas and New Years holidays complicate the situation. What would normally be an attractive buying opportunity might struggle to get off the ground since big money is leaving for vacation. That puts impulsive retail investors in charge and that is rarely a good thing. Luckily, these little guys have small accounts and their emotional buying and selling doesn’t go very far. We saw the emotional selling from Thanksgiving week erased the following week when big money returned to work. And the same could happen here. Most likely the market will muddle into year end and the bigger bounce won’t happen until January. That is if nothing significant occurs between now and then. The one big thing that could happen is the Fed backing away from the widely expected rate hike on Wednesday. That would send the market surging higher. But if that doesn’t happen, expect the market to muddle along between 2,500 and 2,600 for the next two weeks. After that, if the financial world doesn’t collapse, expect the market to recover from these oversold levels as reality turn out far less bad than feared. In my long-term investments, I love buying these discounts and hope prices fall even further so I can buy even more. In my shorter-term trading account, I would rather be buying these discounts than selling them, but I’m not eager to rush in ahead of what could be a volatile holiday. Thursday was a fairly uneventful day for the S&P 500. Early strength gave way to midday losses, but rather than tumble lower, prices recovered and we finished flat. While the price action was fairly “meh”, meh isn’t a bad thing given how dramatic volatility has been. A little bit of nothing helps calm frayed nerves, and that is never a bad thing. While the intraday moves have been huge, the directional moves have not. We are still stuck inside the two-month-old trading range between 2,600 and 2,800. The thing to remember about market collapses is they are breathtakingly quick. Markets don’t wait to see how bad things are before they tumble, traders race for the exits at the first hints of trouble. But that isn’t happening here. Sign up for my FREE Email Alerts to get profitable insights like these delivered to your inbox. On Monday, the S&P 500 briefly broke under October’s lows. But rather than trigger an avalanche of defensive selling, supply dried up and we bounced 60-points above the intraday lows. That was four days ago and so far the market resisted the invitation to collapse under those lows. That said, the last three day’s has seen early gains fizzle and we closed well under the intraday highs. Multiple weak closes is never an encouraging sign. And as usual, the market is giving us conflicting signals. It is up to us to determine what it means. I really like how decisively the market held support this week. But I’m disappointed we couldn’t add to those gains and these weak closes are a concern. What does this mean for what comes next? Unfortunately, this is one of those situations where we don’t have enough information and we need to see what the market does next. A decisive rally Friday tells us all is well and we are on our way back up to 2,800. But a fourth weak close means a near-term test of 2,600 is ahead. And of course the most frustrating outcome, another indecisive day like Thursday that doesn’t tell us anything. I continue to give the market the benefit of doubt because Monday’s reversal was so decisive. But my faith isn’t infinite and unless the market starts doing something constructive, we will likely stumble back to 2,600 support. From there, the situation gets more precarious because few things shatter confidence like screens filled with red. But if we withstand that second test without collapsing, the market is generously giving us another dip-buying opportunity. The headlines have been overwhelmingly bearish lately between arresting a key Chinese executive to Trump threatening to shut down the government. While none of this is good, the pullback in prices means a good chunk of the negativity has already been priced in and these discounts compensate us for taking the risk. Most of the time reality turns out far less bad than feared, and that is probably what will happen this time too. But 2,600 is our line in the sand. Fail to defend that level and things will get worse before they get better. It’s been an incredibly volatile week for the S&P 500. The last five trading sessions produced intraday swings that approached and even exceeded 3%. Tuesday’s price action was no different as a strong open gave way to midday losses, only to see an afternoon bounce push us back into the green, right before a second fizzle left us exactly where we started. This market is definitely in a hurry, unfortunately, it cannot decide which direction it wants to go. These wild swings are giving both bulls and bears something to crow about, but nothing sticks and strong moves reverse days, if not hours later. This extreme volatility is definitely a concern, but what is it trying to tell us? But rather than use “common” sense and assume each dip is a great buying opportunity, or rally a time to take profits, these impulsive bulls and bears ignore the evidence and proclaim this is finally the big move they’ve been waiting for. Since I wrote those words, the market again challenged and even briefly violated October’s lows before bouncing decisively off of 2,600 support. And the cycle of bulls and bears yelling at each other and proclaiming they are right continues. All while smart money is making a boatload of money trading against the crowd. While this volatility is a red flag, even more noteworthy is how resilient this market has been to crashing through support. We had last week’s arrest of a high profile Chinese executive. Then Trump tweets he is perfectly willing to go ahead with his Chinese tariffs. Then today he tells Democrats he would be “proud” to shut down the government. Monday’s dip under October’s lows on awful headlines was the perfect setup for bears. But rather than trigger an avalanche of emotional selling, supply dried up and prices bounced 60-points above the morning lows. Rather than sell the weakness, big money is more inclined to buy these discounts. After two months of relentless bad news, it the market chased off most of the weak owners and replaced them with confident dip buyers. That’s why these relentless waves of bad news are failing to dent this market. Every bottom always feels like things are about to get a lot worse. By rule, it has to. If it didn’t, no one would sell and we wouldn’t dip. At this point, I’m a lot more impressed with the market’s resilience than I am afraid of these fearmongering headlines. That said, we need to continue respecting support. A dip back under 2,600 support over the next day or two tells us demand is absent and lower prices are ahead of us. But if we hold above the lows for the next few days, the trading range is intact and a run back to 2,800 resistance is in the cards. Buy weakness. Sell strength. Repeat. In the market, a lot can happen in a few days. My last free blog post was last Thursday after the S&P 500 smashed through 2,700 resistance. A buying frenzy pushed prices up to the 200dma after the Fed Chairman suggested interest rates were approaching his neutral target. The market was a great buy Monday and Tuesday. But risk is a function of height and Wednesday’s large gains make buying now a lot less attractive. A big chunk of Wednesday’s buying came from chasing and short-covering. Those are both fleeting phenomena and now that they’ve come and gone, we need another group of buyers to come in and push us higher. Unfortunately, many of those with cash remain nervous, especially following such a large move higher. Their fear of heights will likely keep a lid on prices for a few days. And even a dip back to 2,700 wouldn’t be a surprise. Two steps forward, one step back. Sign up for Free Email Alerts so you don’t miss profitable insights like these. While I expected this step-back, even I was caught off guard by the speed with which it happened. But even that isn’t a surprise. The market operates in two speeds, infuriatingly slow, or breathtakingly fast. This time the hivemind got together and turned the last few days of frenzied buying into a mad dash for the exits. Easy come, easy go. While it was nice to see this weakness coming and prepare for it, that was then and this is now. What readers really want to know is what comes next. Stock prices popped Monday after Trump and China reached an agreement this weekend to de-escalate the trade war. But that relief proved fleeting as traders started analyzing the details. The primary catalyst for Tuesday’s collapse was Trump disclosing the strings attached to his pledge to not increase tariffs on Chinese imports. The shine further wore off when Trump reiterated his pledge to impose tariffs if the Chinese didn’t make substantial concessions. That sent risky stocks tumbling and safe-haven bonds soaring. So much for the relief. But the thing we have to ask ourselves is if Tuesday’s collapse was lead by rational and thoughtful selling, or if it was nothing more than herd selling because people sold for no other reason than other people were selling. There are few, if any, 3.25% declines that are led by rational and thoughtful selling. Today was no different. We opened near yesterday’s close and slipped to normal losses by lunchtime, but slipping under Friday’s close triggered an avalanche reactive stop-loss sell orders that didn’t stop until we shed another 60-points. As I wrote previously, 2,700 was a key support level and the market found support and bounced off that critical level in afternoon trade. Unfortunately, the bounce proved fleeting and we closed right back at 2,700 on the nose. The market is closed Wednesday in observance of a national day of mourning for President George H.W. Bush. 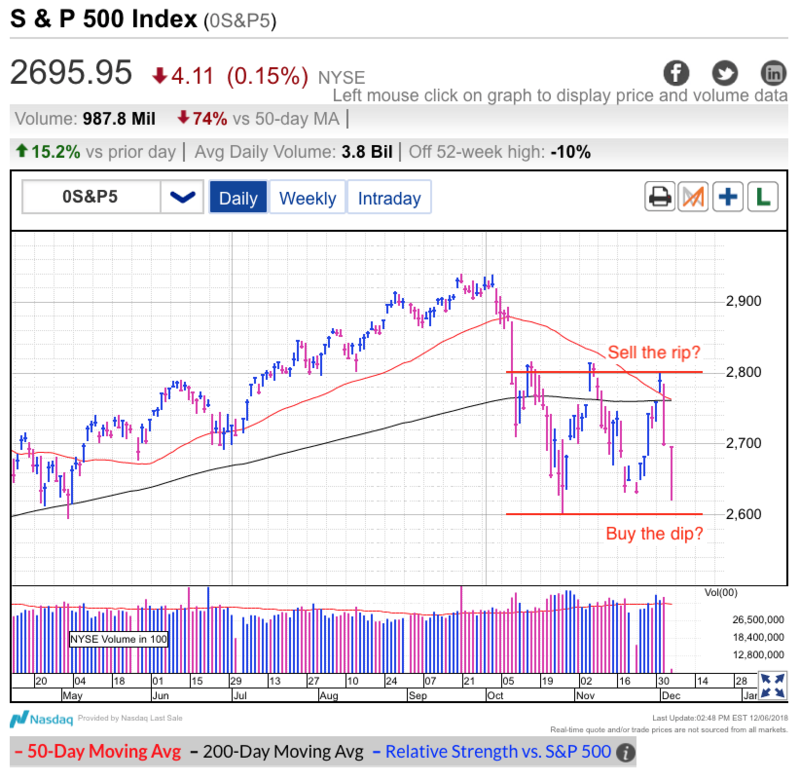 No doubt the inability to trade Wednesday caused many would-be dip-buyers to sit on their hands knowing they would be unable to trade for a day and a half. Better safe than sorry. But the other thing this extra day off does is give traders a chance to collect themselves and decide if they really want to be selling these discounts, or if they should be buying them instead. I expect global stocks to get hammered Wednesday as the world reacts to the U.S. market collapse. But after that, expect cooler heads to prevail. As I’ve been saying for a while, this is a volatile period for stocks. That means we large moves in both directions. But so far those wild gyrations have been consolidating October’s losses, not extending them. There is no reason to think this time is any different. Trading so close to 2,700 support means there is a good chance we will violate it. But as long as the selling stalls and bounces not long after, that tells us most investors would rather buy these discounts than sell them. I bought the Thanksgiving massacre and sold the frenzied relief rally up to 2,800. And I will do the same thing again this time. If impulsive traders want to keep giving away free money, I will gladly continue taking it. What’s a good trade worth? For less than $1/day, have analysis like this delivered to your inbox every day during market hours. Two days ago my free blog post was titled “Why Tuesday was a great day.” Even though the index only finished 0.3% higher, the market’s resilience was impressive given the bearish trade war headlines dominating the financial press. “There are few things more bullish than a market that fails to go down on bad news. That tells us most of the bearishness has already been priced in. Over the last two months, we have witnessed a ton of selling. But what happens every time a fearful owner bails out? He sells his stocks at a steep discount to a confident dip buyer who is willing to own those risks. While I liked what I saw Tuesday, even I was caught off guard by Wednesday’s explosive surge higher in one of the biggest up-days of the year. People often claim no one can predict the market, but that isn’t entirely true. I had zero idea the Fed Chairman would soften his stance on rate hikes Wednesday, but I didn’t need to know that to make an intelligent trading decision Tuesday. I will be the first to admit I cannot predict the news. But the thing to remember is the news doesn’t matter, only the market’s reaction to the news. That one small shift in perspective totally changes how we go about figuring out the market’s next move. Every day traders are bombarded with both bullish and bearish headlines. As traders, it is our job to decide how to interpret these conflicting signals. Sometimes traders gravitate to one piece of news while totally ignoring another one. But even more important than what traders think, is how they trade. Headlines don’t move markets. Neither does the opinion of traders. Only buying and selling moves markets and that is what we must pay attention to. Trump’s latest threats to escalate his trade war and tax all Chinese imports at 25% was obviously a very negative headline. A big chunk of October’s correction was based on investors’ fears the trade war was damaging the global economy. There is no dispute Trump fanning those flames this week was bad. And given October’s plunge, clearly traders are worried about the trade war. But given all the negativity, why did the market finish Tuesday 0.3% higher? It’s not because the news was good. Or because traders don’t fear the fallout of a trade war. It’s because everyone who fears the trade war already sold their stocks and they had nothing left to sell. Once an investor is out of the market, his opinion stops mattering. We can think of the market like a stalled car on a hill. It takes almost zero effort to push the car downhill, while it takes nearly all of our strength to move it one foot uphill. There are times when the market is similar askew. This time it was nearly impossible for bearish headlines to push us any lower because we exhausted the supply of fearful sellers. But in the opposite direction, it only a few words from the Fed Chairman to launch one of the biggest buying frenzies of the year. Without a doubt, it is impossible to predict the news, but if we know what to pay attention to, it isn’t hard to figure out which way the market wants to go. Then it simply becomes a matter of waiting for the right story to come along and give us a push. Everything played out as expected…..except I certainly didn’t expect to be talking about the market running into 200dma resistance 48 hours later. But here we are. But now that we reclaimed 2,700 support, we need to hold this level. Tumbling under this level tells us buyers have zero confidence in this market and lower prices are still ahead of us. But that is the less likely outcome. Right now things look good because big money would rather buy the discounts than sell the dip. 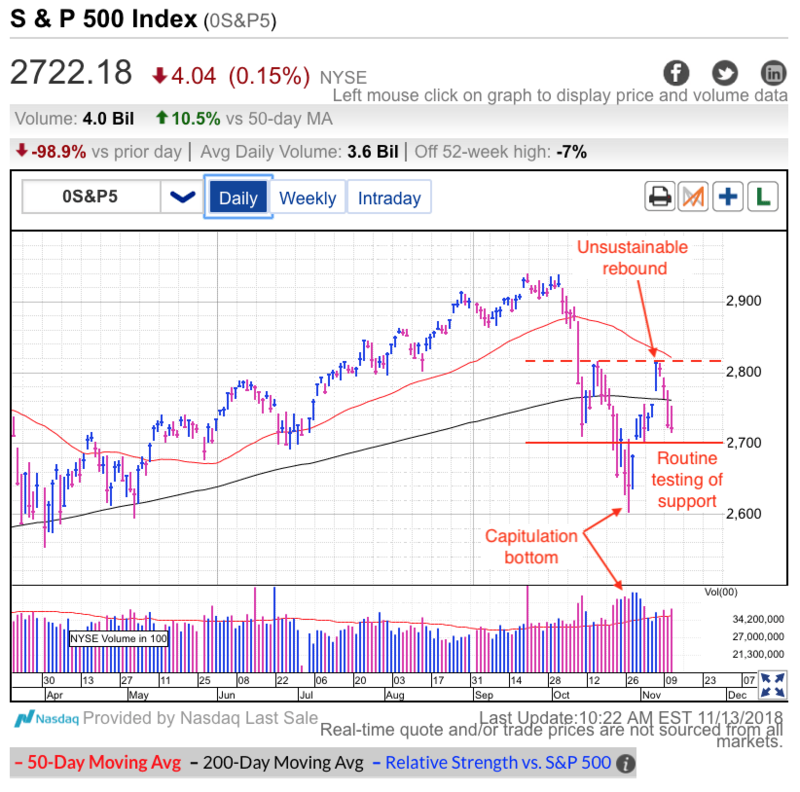 Expect a near-term dip as we digest Wednesday’s huge gains, but after that, expect the rebound to continue up to and above 2,800 over the next few weeks. Tuesday was a great day for the S&P500. While the index only finished 0.3% higher, the numbers don’t tell the whole story. Prices slipped at the open after Trump fanned the trade war flames by threatening to tax all Chinese imports at 25%. This isn’t the first time he made these threats, so it didn’t catch anyone by surprise, but it threw cold water on hopes the two sides were moving toward a compromise. But rather than tumble lower, stocks quickly found a bottom and recovered into the green. This is definitely not the price action we’d expect if the market was fragile and vulnerable. “While this week’s price action slammed us underneath 2,700 support, the thing we have to keep in mind is this is a holiday-affected week. Big money managers who make millions of dollars a year are on vacation this week with their family, not toiling away in the office. Why this is important is because without big money’s guiding hand, emotional retail investors are running the show. Big money’s absence during holidays often leads to increased volatility, and the market shedding nearly 100-points over two days definitely qualifies as volatility. That is precisely what happened and this market finds itself well above last week’s lows. Sign up for Free Email Alerts so you don’t miss profitable insights like these. Recovering from last week’s dip tells us big money would rather buy these discounts than sell the weakness. That was especially true Tuesday when the market failed to tumble on the ominous trade war headlines. There are few things more bullish than a market that fails to go down on bad news. That tells us most of the bearishness has already been priced in. Over the last two months, we have witnessed a ton of selling. But what happens every time a fearful owner bails out, he sells his stocks at a steep discount to a confident dip buyer who is willing to own the risks. Over time these fearful sellers are replaced by confident buyers and there comes the point in every dip where we run out of fearful sellers. Once everyone who fears the headlines sells, there is no one left to sell and the headlines stop mattering. That is what happened today; Trump threatened to take his trade war nuclear and the market yawned. There comes the point in every dip where things go too far and prices are attractive enough for buyers to start ignoring the headlines. It certainly seems like this market is getting to that point. The next most obvious target is reclaiming 2,700 support, and the 200dma after that. We are not out of the woods yet and we should expect volatility to stick around. But the swings are getting smaller and the fear of a collapse are dissipating. We currently find ourselves near the lower end of the trading range and are in a place where the market is brushing off bearish headlines. That tells me the near-term path of least resistance is higher. Things will look different after we run up to the 200dma, but we will discuss what comes after that when we get there. Trump specifically called out Apple when threatening to increase Chinese tariffs to 25%. While that would put a massive hole in AAPL’s earnings, the stock largely shrugged off the news and finished practically flat. That tells us AAPL’s 25% tumble from last month’s highs has already factored in a lot of bad news. If further downside is limited because most of the bad news is already being priced in, that actually makes this a pretty safe time to be buying. While prices could continue slipping, the lower we go, the safer it becomes. It’s been a while since I wrote about Bitcoin because I’ve been so consistently bearish about it there wasn’t much new to add, but now that prices dipped into the $3k’s, the situation has changed. While I’m still skeptical of Bitcoin’s long-term viability, every collapse includes multiple sharp rallies. Given bitcoins sharp fall, I would rather buy these levels than sell them. It wouldn’t be anything to see prices bounce 25% or 50% from current levels. For the most nimble of traders, that’s good money for a few days of work. The challenge is knowing when we will bounce. Anyone buying the dip better be willing to sit through some dramatic near-term weakness first. Tuesday was another dramatic session for the S&P 500 as prices tumbled nearly 2%. The post-election relief is long forgotten as nervous selling pushed prices back near October’s lows. But as horrific as the headlines sound, we have only slipped back to where we started the year and are just 10% under all-time highs. If a person overreacts to flat years and pullbacks from all-time highs, then the stock market might not be a good fit for them. For the rest of us, this is business as usual. While this week’s price action slammed us underneath 2,700 support, the thing we have to keep in mind is this is a holiday-affected week. Big money managers who make millions of dollars a year are on vacation this week with their family, not toiling away in the office. Why this is important is because without big money’s guiding hand, emotional retail investors are running the show. Big money’s absence during holidays often leads to increased volatility, and the market shedding nearly 100-points over two days definitely qualifies as volatility. But the thing to remember about retail investors is they have small accounts. That means they don’t have the firepower to drive large moves. Only big money can propel directional moves and if they’re not behind today’s selling, then we should expect the weakness to stall and reverse once emotional retail investors run out of things to sell. It is hard to ignore 100-point moves, but if big money is not involved, then it means the price action is not relevant to what comes next. Big money always has, and always will, drive the big moves. Emotional retail investors do little more than provide noise along the way. And unfortunately today, that noise was deafening. As I started with, if a person cannot stomach a 10% pullback from all-time highs, they shouldn’t be the market. But for those of us that have been around a while, we are thankful these fearful people are willing to abandon stocks at steep discounts. Their loss is our gain. As for how much further this can go, that is anyone’s guess. Emotional selloffs are the hardest to predict because fearful selling begets fearful selling. While stocks are at attractive levels, that doesn’t mean they cannot get even more attraction. But if I’m buying the dip, I’m not overly worried if I’m buying a 10% discount or a 12% discount. I’ll take every little bit I can get, but I don’t need to be greedy and am more than happy to settle for good enough. As for the bears, it’s been a good run, but now that prices are into correction territory, they need the economy to get worse for us to keep tumbling. Unfortunately, most of the time reality turns out a lot less bad than feared. Will this time turn out any different, no, probably not. But that won’t stop the cynics from shouting that we should abandon the stock market. Should we have seen today’s bounce coming? On Thursday the S&P 500 gapped lower at the open, undercutting the widely followed 2,700 support level and triggering another wave of defensive selling. But in midmorning trade, supply dried up and by the end of the day, the market surged 50-points above those early lows. Everyone knows the market moves in waves, but that doesn’t stop people from being surprised every time it moves in waves. Our bullish or bearish bias convince us each gyration higher or lower is the start of a much larger move. Last week bulls were convinced the market was racing back to the highs. This week bears claimed their long-awaited collapse was finally upon us. And you know what, both sides got it wrong. That’s because they forgot the market moves in waves. Guess what? Thursday’s early selloff failed because we ran out of sellers. Pundits love to tell us no one can predict the market, but it really isn’t that hard once we realize that the same things keep happening over and over. Sign up for Free Email Alerts so you don’t miss profitable insights like these. I wish the only thing we needed to know was what comes next. Then making money would be easy. Unfortunately, that’s not how this works. Not only do we need to know what is going to happen, but more importantly, we need to know when it is going to happen. Getting the timing right is where all the money is made. While no one knows precisely when the market will make its next move, we do know when the odds are on our side. For example, this morning we knew the market was ripe for a bounce. Number one, we remember markets move in waves. Number two, all of the selling over the last few weeks chased off a big chunk of would-be sellers and supply would be tight. 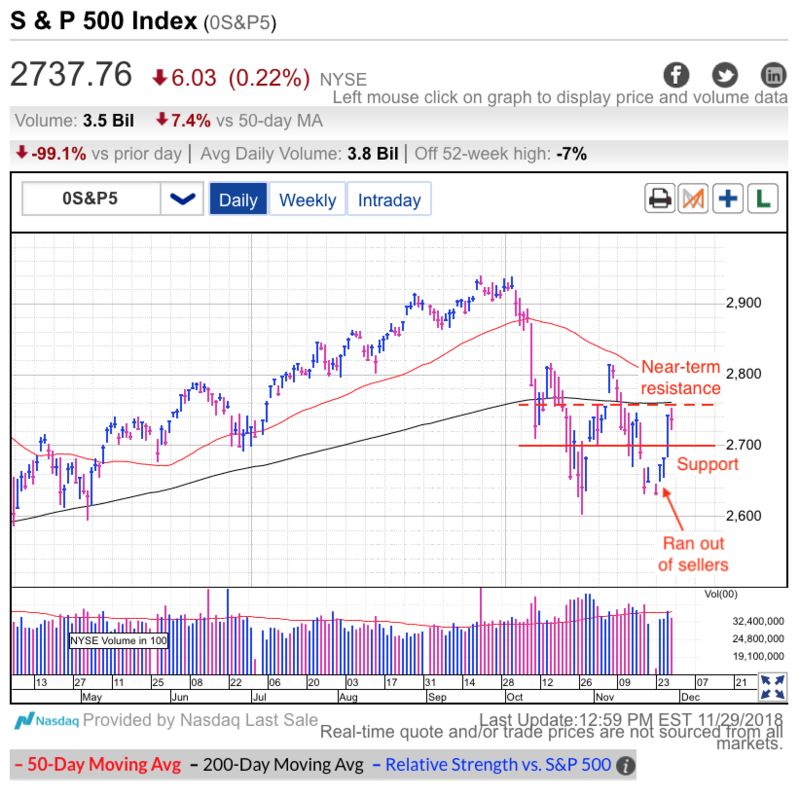 While there are no guarantees in the market, seeing the dip under 2,700 support stall because supply was drying up was a great signal this was time to jump in and buy the dip. If both bulls and bears agree the market moves in waves, then both sides should have seen today’s rebound coming. The main point of contention is what comes next. Bulls say today’s higher-low is a healthy part of the recovery process. Bears claim this bounce only delays the inevitable collapse. But as long as both sides agree we will go higher over the next day or two, there is only one way to trade this. That said, I definitely fall in the bull camp. As we witnessed in October, crashes are breathtakingly quick. Selling begets selling and cracks turn into gaping holes. But that’s not what is happening here. Wednesday’s dip under 2,700 bounced quickly. As did Thursday’s dip under this critical support level. If the market was fragile and vulnerable, that was the perfect way to launch a tidal wave of defensive selling that knocks us under October’s lows. Is that what happened? Nope. Supply dried up and we bounced. 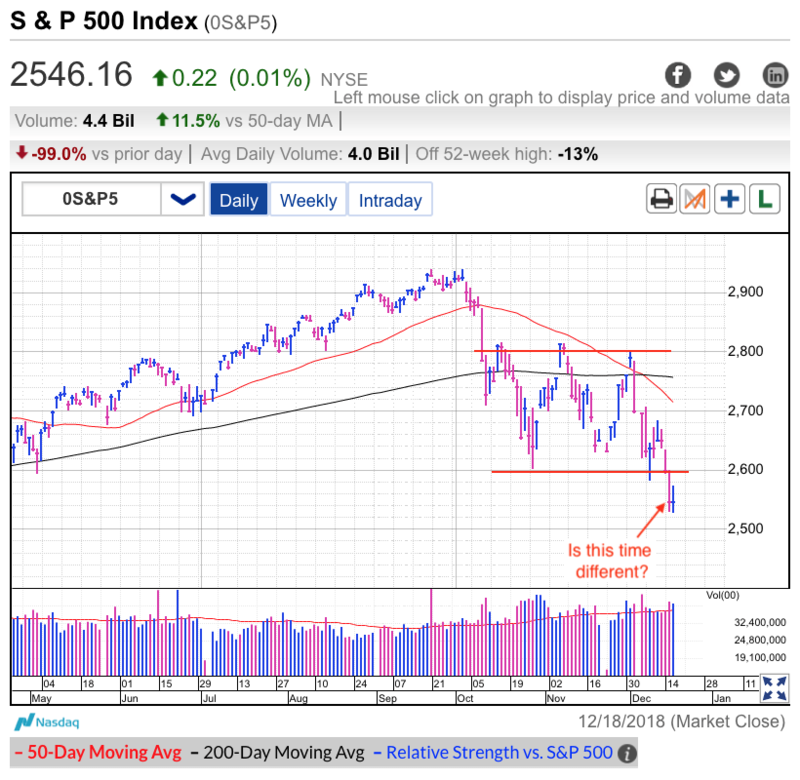 At this point, it is harder to find fearful sellers than confident dip-buyers, and that bodes well for the market’s continued recovery. But just because the market bounced today and things look good, don’t forget markets move in waves. That means this rebound will inevitably stall and pullback. The longer these consolidations drag on, the more volatility shrinks and the smaller these swings become. We are getting further along in the healing process and that means we shouldn’t expect this rebound to be as sharp as last weeks, or for the next dip to be as dramatic. Of course, all of this goes out the window if we tumble under 2,700 support Friday and launch a tidal wave of defensive selling. But barring that worst case scenario, things look good and the path of least resistance over the near-, medium-, and long-term is higher. 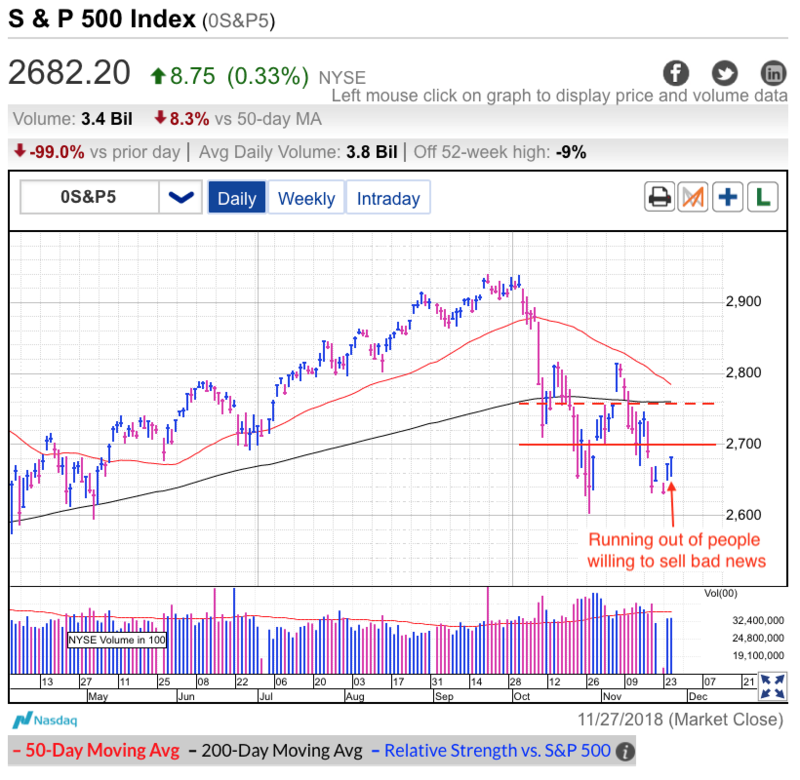 Tuesday was a back-and-forth session for the S&P 500 as early gains fizzled and we closed modestly in the red. 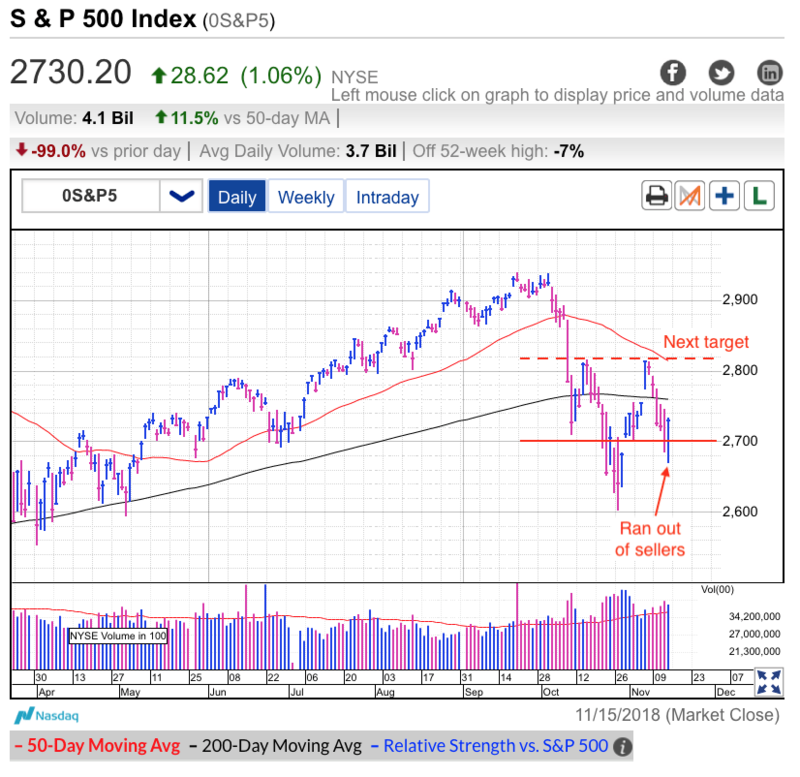 The early strength ran into resistance near the 200dma as last week’s relief turned into this week’s second-guessing. This rebound recovered nearly two-thirds of the October selloff and that is about as far as these things go before they start running out of steam….this is definitely a better place to be taking profits than adding new money. At the very least, expect prices to consolidate for a while as investors warm back up to this market. But more likely, volatility will persist and that means a dip back to 2,700 support would be a normal and healthy part of this recovery. Three trading sessions after I wrote that, we find ourselves testing 2,700 support. Sign up for Free Email Alerts so you don’t miss profitable insights like these. People claim no one can predict the market, but it really isn’t that hard once we realize the same things keep happening. A decisive rebound following October’s sharp correction was never in doubt. The same goes for the subsequent rebound stalling and taking a step back. The question isn’t if, but when. The hard part is getting the timing right and that is where all the money is made. Now that last week’s relief is long gone, we find ourselves questioning this market again. 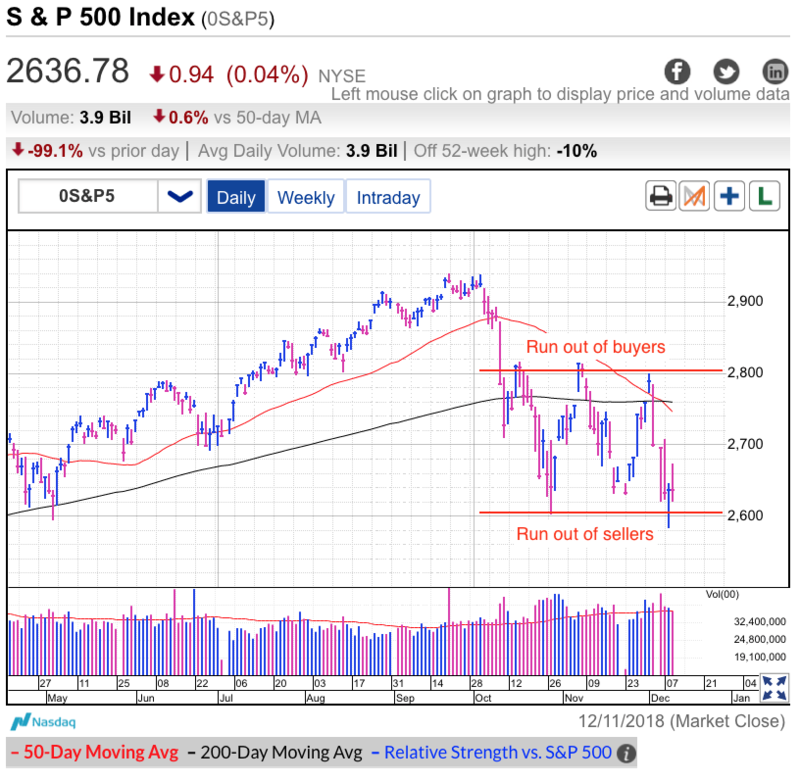 Monday’s collapse under the 200dma was as ominous as it gets and that triggered a wave of defensive selling. Traders who were paralyzed by fear during October’s correction and didn’t bailout were not going to make the same mistake this time. But the thing to remember is most people can only sell once. Once they’re out, their opinion no longer matters. And in fact, the only thing they can do is buy back in. So while a huge number of people sold over the last several weeks, their pessimism no longer matters. And in fact, their pessimism is actually bullish because they will eventually turn into the buyers that fuel the recovery. Buying high and selling low is a poor trading strategy, but the crowd cannot help itself. Every dip feels real and by rule, it has to. If it didn’t, no one would sell and prices wouldn’t dip. Without a doubt, October’s correction felt real. This week’s collapse feels just as scary. But just because it feels real doesn’t make it real. In fact, all of the selling over the last few weeks makes it even harder for this dip to find new sellers. The longer this drags on, the more people sell, the fewer sellers we have left, and the more solid the market becomes. 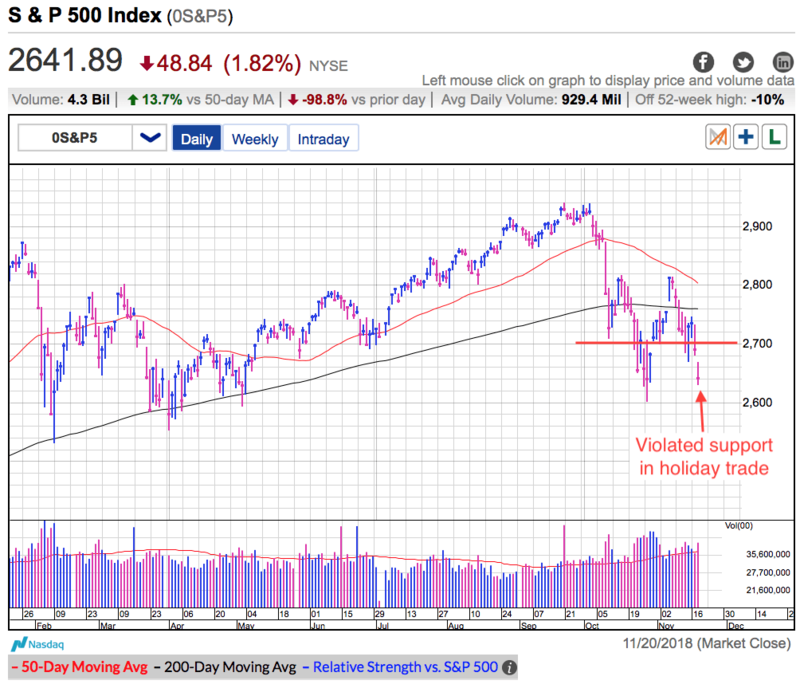 Tuesday’s price action was awful and the longer we hold near 2,700 support, the more likely it is we will violate it. But what matters most is what happens next. Does that violation launch another wave of defensive selling? Or does supply dry up and prices rebound? I think the worst is already behind us, but there are no guarantees in the market. Traders nerves are frayed and anything could happen if panic sets in. But as long as that doesn’t happen, a dip under 2,700 that stalls and recovers is a great entry point for anyone that wants to get back in. Remember, by the time it feels safe, it will be too late to buy the discounts. But if we drop under 2,700 and trigger another avalanche of contagious selling, expect things to get a lot worse.